It’s all fun and games until the tanks roll in…then it’s just a blast! The students at Oarai Academy are bringing back a long forgotten subject that features guns – really, really big guns! Dubbed as Tankery, the program studies the martial art of operating armoured tanks. Clearly this is not for the faint of heart and to join you’ll need people as driven and enthusiastic as the tanks they’ll need to control. Suffice to say the first students to become inducted into the art of Tankery are all a bit eccentric. You have Team Turtle consisting of three members from the student council, Team Duck the former members of the volleyball club, Team Hippo a group of four passionate history buffs, Team Rabbit a mis-match of group six first year students and lastly the stars of the class, Team Anglerfish who are every bit as odd as their mascot. Regardless these girls are all ready to get locked and loaded for the art of Tankery. 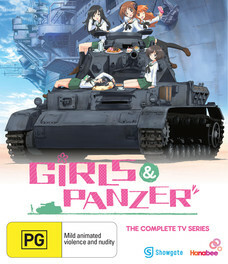 Panzer vor! UPC inaccurate as we do not have ISBN or UPC for Australian release.